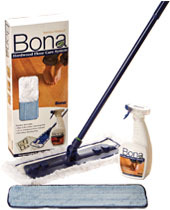 Sweep, vacuum, or dust mop daily or at least twice a week. Particles on your wood floor will grind into the finish (or even the wood) when stepped on. Place mats for wiping feet at entrances, and consider area rugs in high traffic areas. Attach plastic or fabric guides to the bottom of furniture to prevent scratching. Keep your home at a relative humidity level between 40% and 60%. Dry air will increase cracking in your wood floor. If you have dogs, use vinyl nail caps to prevent dents in your floor. Use drapes and shades to minimize the amount of direct sunlight on your floor. Clean up spills immediately. Avoid cleaning with water, unless you know your floor is in waterproof condition. Never use ammonia, oil soaps or waxes. They will dull the finish and make refinishing difficult. Keep high heeled shoes in good repair. Consider creating an area to remove shoes when walking on the floor.